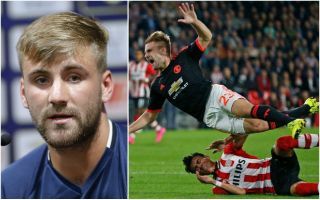 Manchester United left-back Luke Shaw has revealed he thought about stopping playing after his horror injury at the start of the 2015/16 season. The England international looks back to his best now after a lengthy recovery process that has seen him in and out of the team under a demanding Jose Mourinho. Shaw now says he feels good, however, and that certainly looks the case on the pitch after the 23-year-old’s fine form at the start of this season. Now back in the England squad after a call-up on this international break from Gareth Southgate, Shaw has opened up about his horrific leg break three years ago and how it nearly made him hang up his boots. Shockingly, the defender also says he could’ve lost his leg if the injury hadn’t been handled quite so carefully, which just puts his recovery into a whole new perspective. “I’d be lying if I said I didn’t think about stopping playing,” he is quoted by BBC Sport. Credit to Shaw to have the fight and determination to get himself back and win player of the month and back in the England team. ???? The former Southampton man certainly deserves another shot at the England national team and regardless of your club loyalties, many will be happy to see him fulfil the potential he showed as a youngster after this huge setback that nearly cost him not just his career but the chance of leading his normal life as well.